BT launched its new sports channels in the UK earlier this week in a bid to combat the long-standing stranglehold enjoyed by broadcaster BSkyB. BT Infinity and BT broadband subscribers can watch the new programming for free through BT TV or a Sky satellite receiver box, as well as the company’s Web player, iOS and Android apps. Those last three are particularly important, as it means BT Sport is available to the growing number of ‘cord-cutters’ looking to avoid a satellite TV subscription. Google’s Chromecast streaming dongle is yet to launch in the UK, but iOS users can still watch their favorite teams on the big screen using Apple TV and AirPlay. Is this the optimal solution for BT broadband customers? It’s telling that the BT Sport app automatically serves up a number of news items on the home screen, rather than channel options. 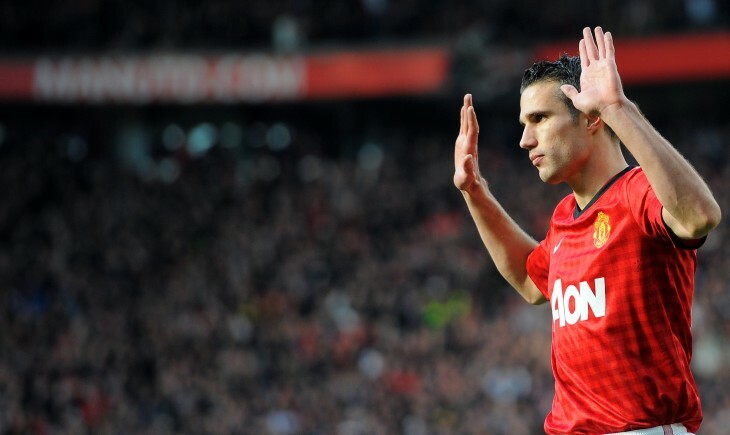 Sky has a formidable reputation as being one of the leading sources of sports-related news – thanks in no small part to its dedicated Sky Sports News TV channel – so BT needs to create a similar authoritative voice and image. Individual stories are shown as bright cards with a high-resolution photo and headline. A quick tap jumps to the article, with a clean but notably basic design. The app offers a few different text size options, but the reading experience is miles away from something like Flipboard. 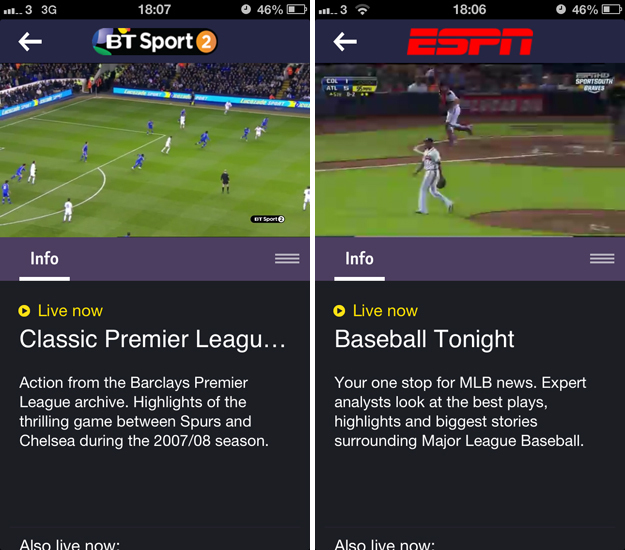 Hitting the ‘Watch’ icon from the top right-hand corner of the screen triggers the in-app viewing guide, which lists what’s live and up next on all three channels – BT Sport 1, BT Sport 2 and ESPN. By default it shows the current day’s programming, although a drop-down menu also details the coming week. A massive omission here is reminders. Especially on mobile, viewers will want to be notified when a game they’re interested in is about to start. Push notifications would be ideal. 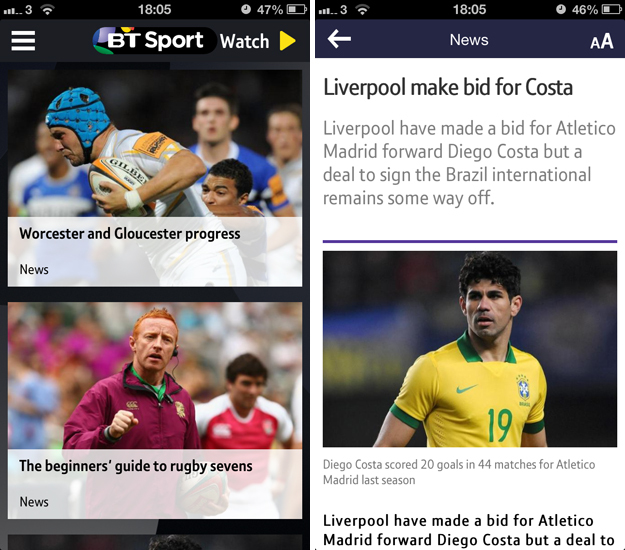 Selecting a live event – highlighted in yellow – reveals the BT Sport player, which users tap once to begin playing their chosen content. It plays in portrait mode by default, although users can switch to landscape by hitting the full screen mode icon at any time. Video quality is very good. Both sound and picture quality is flawless on a Wi-Fi connection, with no buffering or audio syncing issues. That could change on a 3G or 4G connection though and will likely depend on the user’s location and connectivity. The sidebar menu lists a bunch of additional content for users to dig into. The Video section offers a number of short clips and highlights, again using the same card format found in the news feed. It’s clean and easy to navigate, but there are no search options or filtering system – frustrating if the viewer wants to find a certain game or track a specific sport. 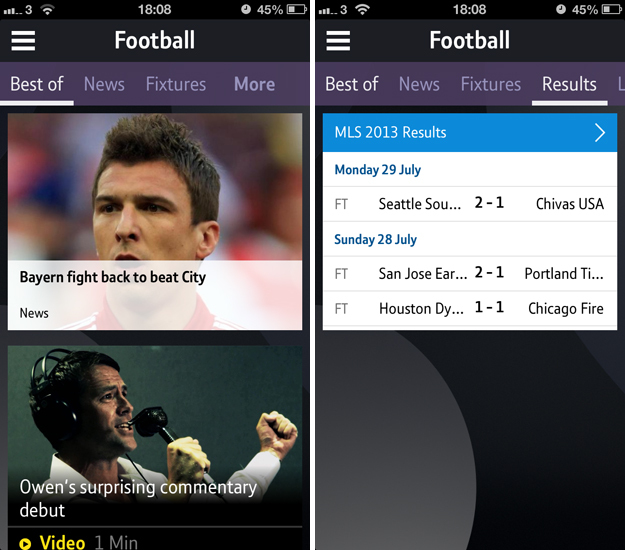 This is catered for somewhat in the subsequent side menu tabs: Football, Rugby Union, Women in Sport and More Sport. But again, there’s no search options. A few tabs can be used to switch between news, videos, fixtures and results, but it’s difficult to find anything related to a favorite team or sportsperson. Social interaction is a big part of BT’s strategy. Staff will be tracking feeds on set and serving up comments, pictures, video and other user-generated content throughout numerous shows. 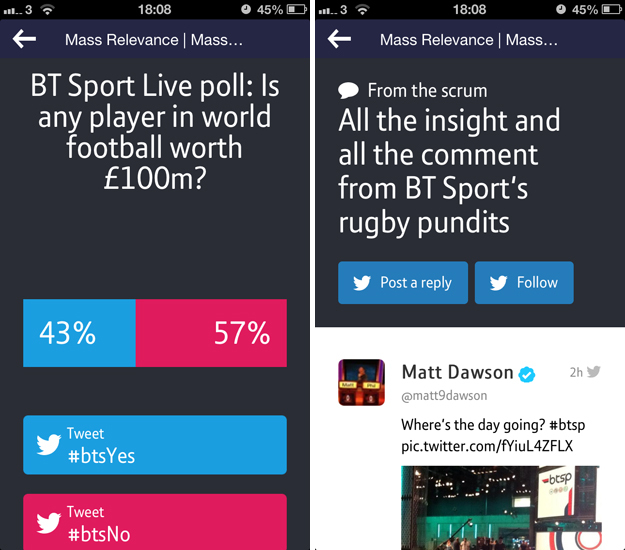 The BT Sport iOS app includes a section called #BTS, which gives viewers the ability to take part in various polls and tweet presenters directly. However, it’s impossible to access while the show is actually playing – unless you’re watching BT Sport through other means. BT isn’t messing around here. The BT Sport app for iOS is very competent at streaming live content and making it very simple to see what’s coming up next. As a source of news it’s pretty basic, but for most people that’s a secondary concern. Plenty of outlets offer free sports journalism – very few broadcast some of the most important sporting events of the year. Especially for viewers that own Apple TV, this is a no brainer. Go download it right now.